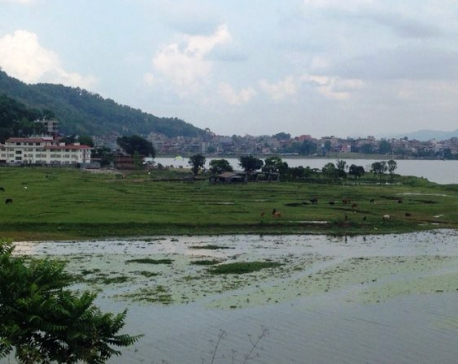 KATHMANDU, Aug 7: People of high social standing are in the forefront in illegally encroaching on Fewa Lake, in the tourist hub of Pokhara. 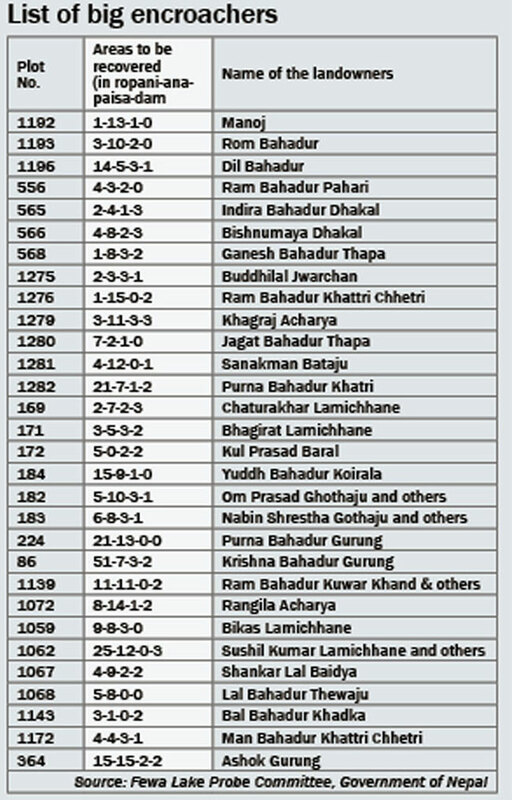 A report submitted by a committee formed to investigate into the land encroachment around the Fewa Lake area has stated that Karna Shakya, initiator of 'Positive Thinking' campaign, hotelier Piyush Bahadur Amatya, surgeon Jagadish Lal Baidya among other prominent names are involved in the encroachment. Those prominent personalities are found to have encroached on Fewa's wetland area and erected illegal structures threatening the very existence of the lake. Shakya has built huge infrastructures and has been operating 'Hotel Waterfront' in the then Sarangkot VDC-5, which lies inside the wetland area. He owns several plots of lands -- 4 ana; 3 ropani, 3 ana, 3 paisa, 1 dam; 2 ana 2 paisa; 5 ana 2 dam; 6 ana 2 paisa; 3 ana; 2 ana; 1 ana 1 paisa; and 5 ana 1 paisa -- all of which fall inside the Few Lake Conservation Area, according to Bishwa Prakash Lamichhane, coordinator of the Fewa Lake Encroachment Probe Committee formed by the government. Similarly, hotelier Amatya also owns several plots of lands inside the conservation area -- 1 ropani; 5 ana 3 paisa; 5 ana 3 paisa 2 dam; 3 ana; 7 ana 3 paisa 3 dam; 10 ana 1 paisa 1 dam; 1 ropani 3 paisa 3 dam; 15 ana 2 paisa 2 dam; 12 ana 3 paisa 1 dam; 2 ropani; 4 ana 1 paisa 2 dam; and 5 ana. Likewise surgeon Baidya owns two plots of lands covering 9 ana 3 paisa 2 dam and 1 ropani, 5 ana, 1 paisa 2 dam inside the wetland area. One ropani is 5476 sq ft; 1 ana is 342.25 sq ft and 1 paisa is 85.56 sq ft.
Land plots demarcated in the then Chapakot VDC-1 and Padeli VDC ward 3 and 5 are of 350 meters to 650 meters in length and around 8 meters width. And the demarcations lines are suspiciously straight. The maps appear to be 'map to ground' whereas they should be 'ground to map'. 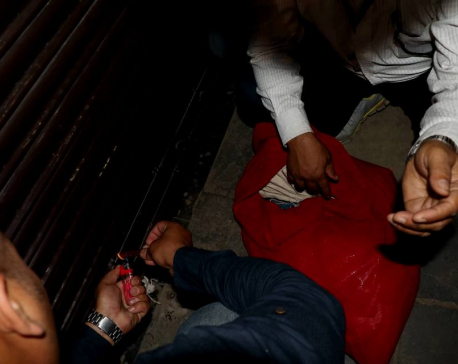 Meanwhile, Attorney General Raman Kumar Shrestha said since the land pieces were illegally registered by private individuals, the government can legally confiscate the land whenever it wishes. 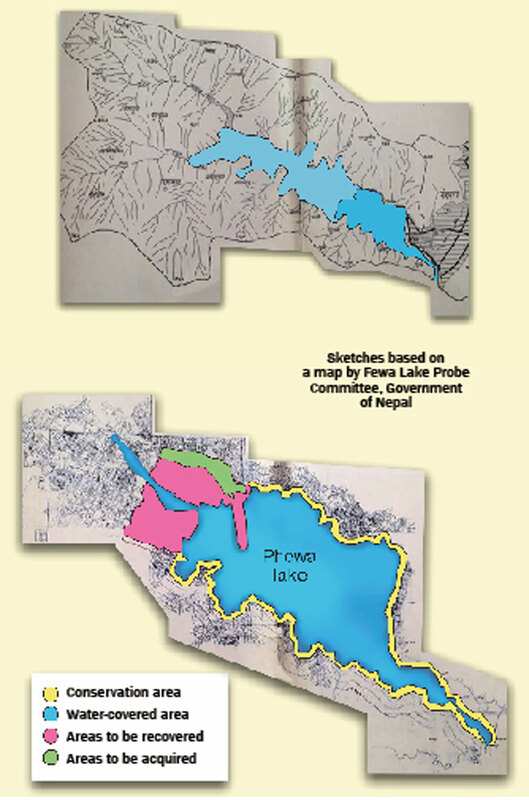 Fewa Lake was spread across 10 square kilometer according to the survey done in 1961 by the Department of Survey. According to the survey in 2007, the lake has shrunk by 4.2 square kilometers. Also, the lake has become shallower over the decades. A survey done in 1974 had shown that the lake was 33 meters deep, but a 2007 survey put the depth at just 18 meters. Water in the lake decreased by about 50 percent after the embankment constructed around the Fewa Lake got destroyed in 1974. As per the current provision, no permanent structure should be built within 65 meters of the lake. However, the provision remains only on paper.